Photo courtesy Steve Inskeep’s Instagram account: @steve_inskeep. There was a wonderful example of merging-the-mediums storytelling today, 2-4-16, with Steve Inskeep reporting from Tehran, Iran. 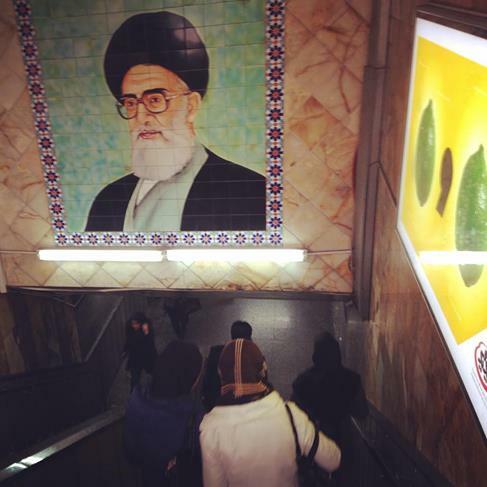 First, I got a “publicity” preview and teaser of what Inskeep and his NPR crew were up to in Iran from interesting photos of Tehran’s subway system on Inskeep’s Instagram account. I happen to be particularly intrigued by photos of subway stations and people using them, so the Instagrams caught my attention right away. Framing his radio story around exploring Tehran’s economic realities on hand, Inskeep wove a fascinating tale of Tehran’s cultural and economic life, and the various divisions of such, through his more traditional radio medium on today’s NPR Morning Edition show. I’m glad I had the visual preview beforehand though, as then I could “go along” with them in a much more visually imaginative way. I need visual prompts. I’ve never, despite years of work in visual mediums, been all that visually imaginative. I’m a text-oriented person who works (and writes) better with literal prompts and signs and messaging of a more graphical interpretation. In other words, radio storytelling, especially in a culture and city as intriguing and vital as Tehran, has its limits despite even Inskeep’s mastery of the medium. And he’s nothing if not a visually-minded storyteller and reporter when he’s on the move. Snapping interesting, contextual photos for Instagram (or wherever) clearly was a perfectly natural response to his new geography. Thus, social media served as a natural enhancement to and for traditional forms of broadcasting. Especially within a place I’ve long been intrigued by and had often heard stories about from relatives who’d lived there ages ago (Shah times). And hope to one day visit myself. Reporting about a place and a people with an enhanced level of audience comprehension and service can only help forge a stronger, intriguing, and respectful relationship between two cultures. Be the media you wish to see.